American daguerreotypers were acknowledged to be the world's leaders. At the World's Fair in Paris, 1851, when they numbered over 10,000, the daguerreotypists of this country took the first prize with a remarkable exhibition. In England, France, and Germany the superiority of American daguerreotypists was acknowledged by advertisements of "the American process." The best daguerreotypist in London was an American, Mayal, and in Paris the same held true with Thompson. The price of daguerreotypes varied from $1.50 to $15, according to the size and case. There was no extra charge for wax to keep wing-shaped ears from standing out or for wads of cotton called "plumpers" to fill out hollow cheeks. The reduction of the time of exposure to a minute or so helped to decrease the cost. The ordinary size of a daguerreotype was 2 inches to 3 inches, and it cost from $2 to $3. The largest size was 13 inches by 14, while the smallest was made for a locket. In 1896 the only daguerreotype studio in the United States was at 19 Tremont Row, Boston. It was owned by Mr. Hawes of the old firm of Southworth & Hawes, and there among daguerreotypes of Webster, Pierce, Garrison, Sumner, Jenny Lind, Charlotte Cushman, and Harriet Beecher Stowe any one who had the inclination and the money could sit for a daguerreotype. Unknown, "Centenary of Dr. John William Draper." Wilson's Photographic Magazine. 1911. p. 246 - 250. Unknown, photographer. 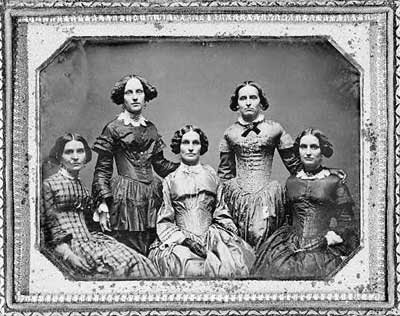 “[Clark sisters, five women, three-quarter length portraits, all facing front]” Daguerreotype. c1840-1860. From Library of Congress: Francis Benjamin Johnston collection; Daguerreotype collection. http://hdl.loc.gov/loc.pnp/cph.3d02003 (accessed October 10, 2008).